Use Forrester's Perishable Insights Framework To Prevent Fresh Data From Going Stale. Start with a brief overview of the capabilities and then see the steps to get it up and running in your environment. This hands-on lab and tutorial shows how to deploy Db2 Event Store to build streaming applications. theCUBE interviews IBM Fellow Namik Hrle on the value of fast data and how IBM Db2 Event Store can help. Explore the use of Jupyter notebooks with Db2 Event Store. Compare running SQL queries with Db2 Event Store vs standard Db2. In 80 seconds see why, where and how Fast Data is changing the way businesses operate and compete. See how a retail business uses IBM Event Store to derive customer insights from click stream data. View the Demo, get the code, see the flow diagram and more to help you get started with Db2 Event Store fast. Demo integrating Db2 Event Store and Lightbend Fast Data Platform to create an event-driven app to predict weather patterns. Get started with the best tips, a demo and online walk-thru by our master inventor behind Db2 Event Store. Gain faster, deeper insights for smarter responses to rapidly occurring events. Purchase IBM FlexPoints and allocate towards multiple resources with a single, subscription-based license. See how, with access to complete sets of event data, businesses can derive insights from comprehensive data analysis. Learn how the event-driven approach works, and why it has special benefits for these use-cases. Find out about addressing complexity in a decades-old architecture. Read how IBM offers an integrated system to ingest, persist and analyze event data of any type. See why event-driven applications are addressing the next level of intelligent energy systems. Learn how event processing can potentially be applied with great effect. 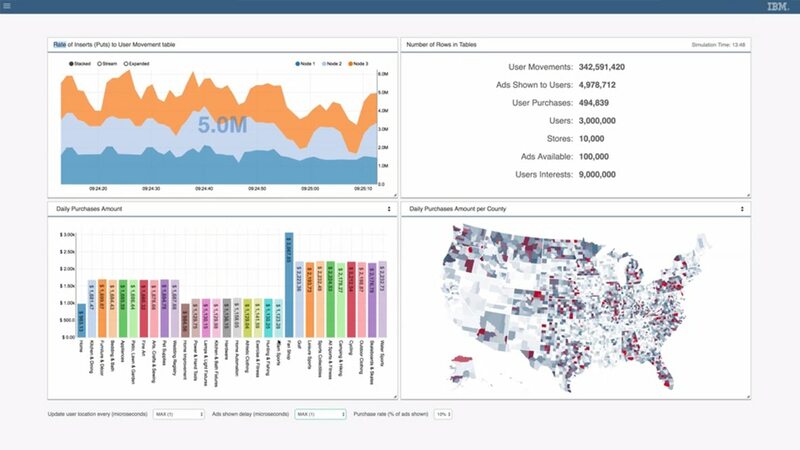 Db2 Event Store can ingest and analyze 250 billion events a day. Integrated ML and data science enable smarter responses. Read how this Forrester report can help you learn how your business may be wasting money by letting data insights spoil.